On the first page after you click “Click Here to Pay Your Bill”, you will be prompted for the total amount of your payment. After entering in your payment amount, you must enter the security code to continue on to the Order Information page. ￼In the “Description” field, you need to fill in who the payment is to be applied to, in the example above, “Joe Sample” is the patient. 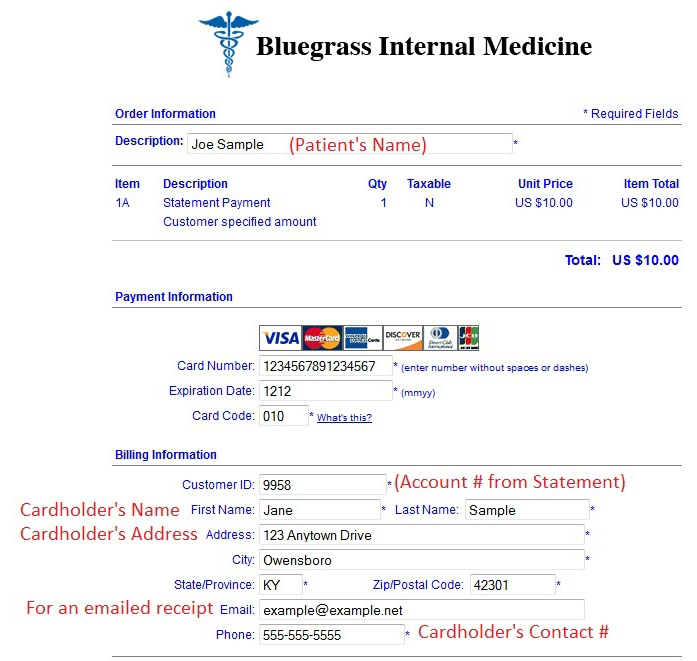 Under the Billing Information section, the “First Name”, “Last Name” and “Address” fields all need to be filled in with the Cardholder’s name and address. A valid phone number is also required so that we may contact the cardholder to ensure the payment is applied to the proper account(s). If you would like a receipt e-mailed to you, put your email address in the “Email” field, this is not required, but will let you easily keep track of your payments. If you are unsure the total on your statement is correct, you can call the Billing Office at 270-852-8934 to verify your total. (Open: Monday-Friday 9am-5pm CST, except Holidays).